On arrival at Cochin International Airport, you are greeted and escorted to the historic Willington Island. In Cochin, you may explore the ancient Harbour, with its rich colonial past, the old spice market at Mattancherry, the antique shops on Jew’s street, the Synagogue, the Dutch palace and of course, the famous Chinese fishing nets, St. Francis Church and Harbour Cruise in the evening. Spend the day as you will and return to your hotel for dinner and overnight stay. After a refreshing breakfast, leave for Kumarakom, a land lying on the banks of Lake Vembanad, enveloped with stunning scenery. Engage in what the locals master in - pluck huge coconuts and learn de-husking, breaking and grating them to prepare delicious dishes, flavored with exotic spices! Kumarakom Bird Sanctuary, a home to thousand and more of rare species of birds, is also included in the itinerary. Return to the hotel for an overnight stay. Spend the full day at Leisure and sleep overnight at hotel, after a scrumptious dinner. After a refreshing breakfast, set out on an enchanting overnight backwater cruise in traditionally decorated houseboats. While cruising in these floating luxury-villas, let your eyes settle for the rare and the unusual - skim past Chinese fishing nets, bowed-down paddy fields, local inhabitants engaged in making coir products, rustic homes, ancient temples and swaying coconut groves. The food will be served on board. Stay overnight on the houseboat and end this memorable cruise at Alleppey next morning. After a delicious breakfast served on board, check out from the houseboat and drive to Kovalam. On arrival, check-in to your hotel. 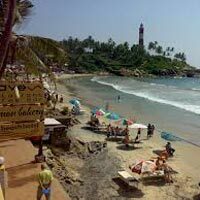 This beach town, held high among international tourists, is an ideal destination to feel the tropical sun and to feel contented about the golden suntan. Water enthusiasts have a lot of beach activities to indulge in like kayaking, swimming, surfing and skiing. Occasionally, walk into some of the certified massaging centers alongside the beach and pamper yourself with an exotic herbal, body-toning massage. After a delicious dinner, spend the night at your beach-side hotel. After breakfast this morning, set out on a sightseeing tour to Trivandrum. Your itinerary will include places of interests like Padmanabhaswamy Temple, renowned for its towering Gopuras and temple arts and paintings. The main pavilion of the temple stands impressive with 400 marvelously granite carved pillars. Your guided sightseeing tour will cover the rest of the attractions too. 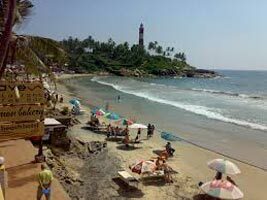 Later in the evening, return to Kovalam for dinner and overnight stay in your hotel. Pack up your bags, enjoy a hearty breakfast and check-out from your hotel. We will drive you to Trivandrum Airport for your onward journey.